For other uses, see Fleur-de-lis (disambiguation). The fleur-de-lis or fleur-de-lys (plural: fleurs-de-lis, or fleurs-de-lys)[pron 1] is a stylized lily (in French, fleur means "flower", and lis means "lily") that is used as a decorative design or motif. Many of the Catholic saints of France, particularly St. Joseph, are depicted with a lily. Since France is a historically Catholic nation, the fleur-de-lis became "at one and the same time, religious, political, dynastic, artistic, emblematic, and symbolic", especially in French heraldry. The fleur-de-lis is represented in Unicode at U+269C (⚜) in the Miscellaneous Symbols block. While the fleur-de-lis has appeared on countless European coats of arms and flags over the centuries, it is particularly associated with the French monarchy in a historical context, and continues to appear in the arms of the King of Spain (from the French House of Bourbon) and the Grand Duke of Luxembourg and members of the House of Bourbon. It remains an enduring symbol of France which appears on French postage stamps, although it has never been adopted officially by any of the French republics. According to French historian Georges Duby, the three petals represent the three medieval social estates: the commoners, the nobility, and the clergy. It remains unclear where the fleur-de-lis originated, though it has retained an association with French nobility. It is widely used in French city emblems as in the coat of arms of the city of Lille, Saint-Denis, Brest, Clermont-Ferrand, Boulogne-Billancourt and Calais. Some cities that had been particularly faithful to the French Crown were awarded[by whom?] a heraldic augmentation of two or three fleurs-de-lis on the chief of their coat of arms; such cities include Paris, Lyon, Toulouse, Bordeaux, Reims, Le Havre, Angers, Le Mans, Aix-en-Provence, Tours, Limoges, Amiens, Orléans, Rouen, Argenteuil, Poitiers, Chartres and Laon among others. 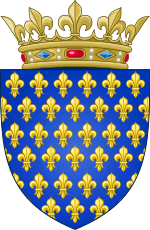 The fleur-de-lis was the symbol of Île-de-France, the core of the French kingdom. It has appeared on the coat-of-arms of other historical provinces of France including Burgundy, Anjou, Picardy, Berry, Orléanais, Bourbonnais, Maine, Touraine, Artois, Dauphiné, Saintonge and the County of La Marche. Many of the current French departments use the symbol on their coats-of-arms to express this heritage. In Italy, the fleur de lis, called giglio, is mainly known from the crest of the city of Florence. In the Florentine fleurs-de-lis,[f] the stamens are always posed between the petals. Originally argent (silver or white) on gules (red) background, the emblem became the standard of the imperial party in Florence (parte ghibellina), causing the town government, which maintained a staunch Guelph stance, being strongly opposed to the imperial pretensions on city states, to reverse the color pattern to the final gules lily on argent background. This heraldic charge is often known as the Florentine lily to distinguish it from the conventional (stamen-not-shown) design. As an emblem of the city, it is therefore found in icons of Zenobius, its first bishop, and associated with Florence's patron Saint John the Baptist in the Florentine fiorino. Several towns subjugated by Florence or founded within the territory of the Florentine Republic adopted a variation of the Florentine lily in their crests, often without the stamens. The heraldic fleur-de-lis is still widespread: among the numerous cities which use it as a symbol are some whose names echo the word 'lily', for example, Liljendal, Finland, and Lelystad, Netherlands. This is called canting arms in heraldic terminology. Other European examples of municipal coats-of-arms bearing the fleur-de-lis include Lincoln in England, Morcín in Spain, Wiesbaden in Germany, Skierniewice in Poland and Jurbarkas in Lithuania. The Swiss municipality of Schlieren and the Estonian municipality of Jõelähtme also have a fleur-de-lis on their coats. In Malta, the town of Santa Venera has three red fleurs-de-lis on its flag and coat of arms. These are derived from an arch which was part of the Wignacourt Aqueduct that had three sculpted fleurs-de-lis on top, as they were the heraldic symbols of Alof de Wignacourt, the Grand Master who financed its building. Another suburb which developed around the area became known as Fleur-de-Lys, and it also features a red fleur-de-lis on its flag and coat of arms. The coat of arms of the medieval Kingdom of Bosnia contained six fleurs-de-lis, understood as the native Bosnian or Golden Lily, Lilium bosniacum. This emblem was revived in 1992 as a national symbol of the Republic of Bosnia and Herzegovina and was the flag of Bosnia-Herzegovina from 1992 to 1998. The state insignia were changed in 1999. 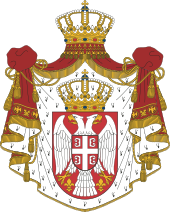 The former flag of the Federation of Bosnia and Herzegovina contains a fleur-de-lis alongside the Croatian chequy. Fleurs also appear in the flags and arms of many cantons, municipalities, cities and towns. It is still used as official insignia of the Bosniak Regiment of the Armed Forces of Bosnia and Herzegovina. In the United Kingdom, a fleur-de-lis has appeared in the official arms of the Norroy King of Arms for hundreds of years. A silver fleur-de-lis on a blue background is the arms of the Barons Digby. In English and Canadian heraldry the fleur-de-lis is the cadence mark of a sixth son. In Mauritius, slaves were branded with a fleur-de-lis, when being punished for escaping or stealing food. The symbol is also often used on a compass rose to mark the north direction, a tradition started by Pedro Reinel. The dark code was an arrangement of controls received in Louisiana in 1724 from other French settlements around the globe, intended to represent the state's slave populace. Those guidelines included marking slaves with the fleur-de-lis as discipline for fleeing. The Dorje Arhats who were known among the Indo-European Kingdoms and territories of Šangšung, Tokaria, Kotan, Sparia, Śaka, Sarmatia, White Croatia and White Serbia were called by the Sarmatians and Slavs Dzierżoń and their ritual Đorđe, Dzierżoń became the coat of arms of Pilzno, Nowotaniec and some other settlements - its later derivate, the Piernacz (Pernač) was used since the 12th century in Poland and Kievan Rus'. Đorđe-Dzierżoń of White Serbia was known to western chroniclers of the earty 7th century as Dervan, Derwan, Der and his capital was Mišno. The dynasty was among the founders of the Commonwealth of Samo, Great Moravia and subsequently Bohemia, Poland, Principality of Kopnik (Berlin-Brandenburg) and other states. The ancient dynasty along with the Čakravartin (Kołodzieje) of the Iakšaku (Jakszyce, Jakšići) Kāśyapa Kāsper Spyra (Spera, Sperun), known as Brahmini, Magi and Druids of Sparia, Persia, Speria, Sparda, Korontania, Boio-Aria (Bavaria), Hercynia, Spyrgowa (Spyrgovia, Spirgowe), Spira, Paris, Pirna and all of Esperia (name of Western Europe used by ancient Greeks) were among the progenitors of the Polish Piast dynasty. Their ritual hats called Piasta or by the Hellenes Polos lost in Boio-Aria (Boho-Aria, Bago-Aria) and Hercynia already during the Roman and Marcomannic invasions were recently unearthed. Around 624 Đorđe-Dervan-Dzierżoń together with Iakšaku-Kāśyapa-Kāsper-Spyra (Spera, Sperun…) joined Samo, a noble descendant of the Senones of Sens, consolidating the first Celto-Slavic state. Spyra (Head of the Gauls) e.g. Pernus (Germanized version Brennus), the founders of Perusia and Spyrgowa (Spyrgovia, Spirgowe), and Senones, the founders of Senigallia, continued their old, dating back to at least 400 BC, close relations on the, devastated by Marcomannic Wars and the Turkic Huns & Avars land of the Boii, Veneti & Kotini now strengthened by their kinsmen Slavs, founding the Commonwealth of Samo and subsequently Great Moravia. Some of those facts found an entry in the Chronicle of Fredegar. Through Samo and via Sens this ancient Vedic-Buddhist symbol was modified and adopted as Christian Fleur-de-lis. This development was supported by Wynfryth of Wessex, since whose time the official use of the White-Red (Brahmini-Kšatriya) flags and the ancient Sudaršana Čakra (Wheel of Perun-Parjanya-Indra-Taranis-IX, now known as Wheel of Mainz) was no more sanctioned by Germanic invaders. Nevertheless, until around 777 the remaining Veneti-Boii-Slavs of Boio-aria (Bavaria), now invaded and settled by Germans, were enslaved by Tassilo III. Their ancient (Kopa/Hallstatt and La Tène) industries along their castles were acquired by Germanic invaders. The use of a triple Fleur-de-lis is basically a modified representation of the ancient Triskelion. Some details were described in the Chronicle of Fredegar, others may be found in the archives of the Křemenec (Kremsmünster) Abbey, near Salzburg. For German scholars studying those archives the connection between Slavs and Sens remains a mystery. The old fleurs-de-lis, especially the ones found in our first kings' sceptres, have a lot less in common with ordinary lilies than the flowers called flambas [in Occitan], or irises, from which the name of our own fleur-de-lis may derive. What gives some colour of truth to this hypothesis that we already put forth, is the fact that the French or Franks, before entering Gaul itself, lived for a long time around the river named Leie in the Flanders. Nowadays, this river is still bordered with an exceptional number of irises —as many plants grow for centuries in the same places—: these irises have yellow flowers, which is not a typical feature of lilies but fleurs-de-lis. It was thus understandable that our kings, having to choose a symbolic image for what later became a coat of arms, set their minds on the iris, a flower that was common around their homes, and is also as beautiful as it was remarkable. They called it, in short, the fleur-de-lis, instead of the flower of the river of lis. This flower, or iris, looks like our fleur-de-lis not just because of its yellow colour but also because of its shape: of the six petals, or leaves, that it has, three of them are alternatively straight and meet at their tops. The other three on the opposite, bend down so that the middle one seems to make one with the stalk and only the two ones facing out from left and right can clearly be seen, which is again similar with our fleurs-de-lis, that is to say exclusively the one from the river Luts whose white petals bend down too when the flower blooms. The heraldist François Velde is of the same opinion. However, a hypothesis ventured in the 17th c. sounds very plausible to me. One species of wild iris, the Iris pseudacorus, yellow flag in English, is yellow and grows in marshes (cf. the azure field, for water). Its name in German is Lieschblume (also gelbe Schwertlilie), but Liesch was also spelled Lies and Leys in the Middle Ages. It is easy to imagine that, in Northern France, the Lieschblume would have been called "fleur-de-lis." This would explain the name and the formal origin of the design, as a stylized yellow flag. There is a fanciful legend about Clovis which links the yellow flag explicitly with the French coat of arms. Sauvages' hypothesis seems to be supported by the archaic English spelling fleur-de-luce and by the Luts's variant name Lits. It has consistently been used as a royal emblem, though different cultures have interpreted its meaning in varying ways. Gaulish coins show the first Western designs which look similar to modern fleurs-de-lis. In the East it was found on the gold helmet of a Scythian king uncovered at the Ak-Burun kurgan and conserved in Saint Petersburg's Hermitage Museum. There is also a statue of Kanishka the Great, the emperor of the Kushan dynasty in 127–151 AD, in the Mathura Museum in India, with four modern Fleurs-de-lis symbols in a square emblem repeated twice on the bottom end of his smaller sword. Another (debated) hypothesis is that the symbol derives from the Frankish Angon. The angon, or sting, was a typical Frankish throwing spear. A possibly derived symbol of Frankish royalty was the bee, of similar shape, as found in the burial of Childric I, whose royal see of power over the Salian Franks was based over the valley of the Lys. Another heraldic tradition, going back to at least the 17th century, identifies the emblem of the Childric as a frog or toad (crapaud) rather than a bee. Antoine Court de Gébelin writing in 1781 identified the toad as the emblem of the Ripuarian Franks, representing their origin from the marshlands. The graphic evolution of crita to fleur-de-lis was accompanied by textual allegory. 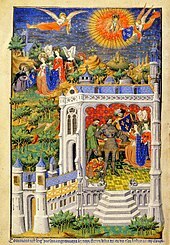 By the late 13th century, an allegorical poem by Guillaume de Nangis (d. 1300), written at Joyenval Abbey in Chambourcy, relates how the golden lilies on an azure ground were miraculously substituted for the crescents on Clovis' shield, a projection into the past of contemporary images of heraldry. Through this propagandist connection to Clovis, the fleur-de-lis has been taken in retrospect to symbolize all the Christian Frankish kings, most notably Charlemagne. The fleur-de-lis' symbolic origins with French monarchs may stem from the baptismal lily used in the crowning of King Clovis I. The French monarchy possibly adopted the Fleur-de-lis for its royal coat of arms as a symbol of purity to commemorate the conversion of Clovis I, and a reminder of the Fleur-de-lis ampulla that held the oil used to anoint the king. So, the fleur-de-lis stood as a symbol of the king's divinely approved right to rule. The thus "anointed" Kings of France later maintained that their authority was directly from God. A legend enhances the mystique of royalty by informing us that a vial of oil—the Holy Ampulla—descended from Heaven to anoint and sanctify Clovis as King, descending directly on Clovis or perhaps brought by a dove to Saint Remigius. One version explains that an angel descended with the Fleur-de-lis ampulla to anoint the king. Another story tells of Clovis putting a flower in his helmet just before his victory at the Battle of Vouillé. Through this connection to Clovis, the fleur-de-lis has been taken to symbolize all the Christian Frankish kings, most famously Charlemagne. In the 14th-century French writers asserted that the monarchy of France, which developed from the Kingdom of the West Franks, could trace its heritage back to the divine gift of royal arms received by Clovis. This story has remained popular, even though modern scholarship has established that the fleur-de-lis was a religious symbol before it was a true heraldic symbol. Along with true lilies, it was associated with the Virgin Mary, and in the 12th century Louis VI and Louis VII started to use the emblem, on sceptres for example, so connecting their rulership with this symbol of saintliness and divine right. Louis VII ordered the use of fleur-de-lis clothing in his son Philip's coronation in 1179, while the first visual evidence of clearly heraldic use dates from 1211: a seal showing the future Louis VIII and his shield strewn with the "flowers". Until the late 14th century the French royal coat of arms was Azure semé-de-lis Or (a blue shield "sown" (semé) with a scattering of small golden fleurs-de-lis), but Charles V of France changed the design from an all-over scattering to a group of three in about 1376. [a][b] These two coats are known in heraldic terminology as France Ancient and France Modern respectively. In the reign of King Louis IX (St. Louis) the three petals of the flower were said to represent faith, wisdom and chivalry, and to be a sign of divine favour bestowed on France. During the next century, the 14th, the tradition of Trinity symbolism was established in France, and then spread elsewhere. 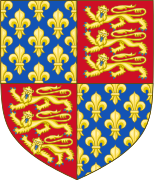 In 1328, King Edward III of England inherited a claim to the crown of France, and in about 1340 he quartered France Ancient with the arms of Plantagenet, as "arms of pretence". [c] After the kings of France adopted France Modern, the kings of England adopted the new design as quarterings from about 1411. The monarchs of England (and later of Great Britain) continued to quarter the French arms until 1801, when George III abandoned his formal claim to the French throne. King Charles VII ennobled Joan of Arc's family on 29 December 1429 with an inheritable symbolic denomination. The Chamber of Accounts in France registered the family's designation to nobility on 20 January 1430. The grant permitted the family to change their surname to du Lys. France Modern remained the French royal standard, and with a white background was the French national flag until the French Revolution, when it was replaced by the tricolor of modern-day France. The fleur-de-lis was restored to the French flag in 1814, but replaced once again after the revolution against Charles X of France in 1830. [d] In a very strange turn of events after the end of the Second French Empire, where a flag apparently influenced the course of history, Henri, comte de Chambord, was offered the throne as King of France, but he agreed only if France gave up the tricolor and brought back the white flag with fleurs-de-lis. His condition was rejected and France became a republic. In Italy, fleurs-de-lis have been used for some papal crowns[g] and coats of arms, the Farnese Dukes of Parma, and by some doges of Venice. Other countries include Spain in recognition of rulers from the House of Bourbon. Coins minted in 14th-century Romania, from the region that was the Principality of Moldova at the time, ruled by Petru I Mușat, carry the fleur-de-lis symbol. As a dynastic emblem it has also been very widely used: not only by noble families but also, for example, by the Fuggers, a medieval banking family. Three fleurs-de-lis appeared in the personal coat of arms of Grandmaster Alof de Wignacourt who ruled the Malta between 1601 and 1622. His nephew Adrien de Wignacourt, who was Grandmaster himself from 1690 to 1697, also had a similar coat of arms with three fleurs-de-lis. Fleurs-de-lis crossed the Atlantic along with Europeans going to the New World, especially with French settlers. Their presence on North American flags and coats of arms usually recalls the involvement of French settlers in the history of the town or region concerned, and in some cases the persisting presence there of a population descended from such settlers. The fleur-de-lis appears on the Canadian coat of arms, the flag of Quebec as well as the flags of the cities of Montreal, Sherbrooke and Trois-Rivières. 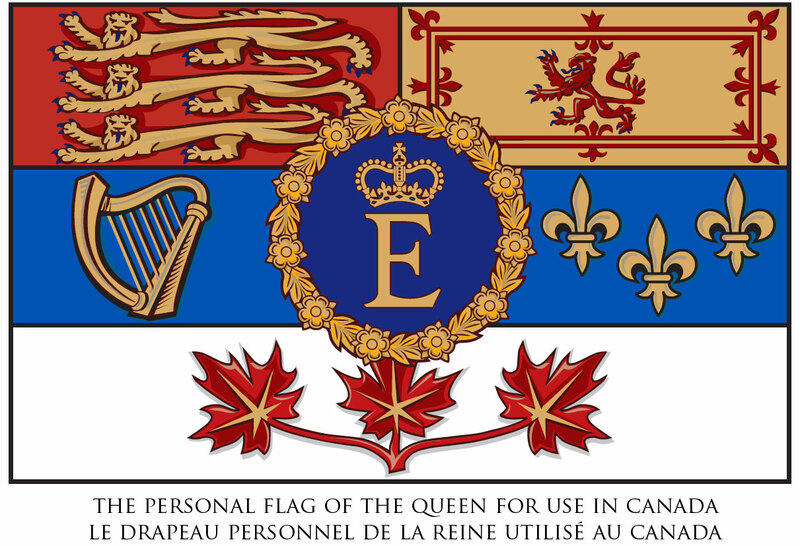 It is also featured on the personal flag used by the Queen of Canada. There are many French-speaking people in other Canadian provinces for whom the fleur-de-lis remains a symbol of their cultural identity. Franco-Ontarians, for example, feature the fleur-de-lis prominently on their flag. In Saskatchewan the Western Red Lily appears on the provincial flag and is sometimes used as a symbol of the province. Some representations resemble a fleur de lis but the traditional version itself is rarely used. In the US, the fleur-de-lis symbols tend to be along or near the Mississippi and Missouri rivers. These are areas of strong French colonial empire settlement. Some of the places that have it in their flag or seal are the cities of St. Louis,[m] Louisville, Detroit, Mobile, New Orleans, Baton Rouge and Lafayette. On 9 July 2008, Louisiana governor Bobby Jindal signed a bill into law making the fleur-de-lis an official symbol of the state. Following Hurricane Katrina, the fleur-de-lis has been widely used in New Orleans and throughout Louisiana, as a symbol of grassroots support for New Orleans' recovery. It has also become the symbol for the identity of the Cajuns and Louisiana Creole people, and their French heritage. The fleur-de-lis appears on the coat of Guadeloupe, an overseas département of France in the Caribbean, Saint Barthélemy, an overseas collectivity of France, and French Guiana. The overseas department of Réunion in the Indian Ocean uses the same feature. It appears on the coat of Port Louis, the capital of Mauritius which was named in honour of King Louis XV. On the coat of arms of Saint Lucia it represents the French heritage of the country. Arms of the Farnese family. 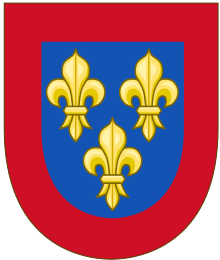 Fleur-de-lis on the coat of arms of Ýñigo-Genio family, Or, six fleur-de-lis in orle, five gules and one in chef azure. The augmented coat of arms of the Medici, Or, five balls in orle gules, in chief a larger one of the arms of France (viz. 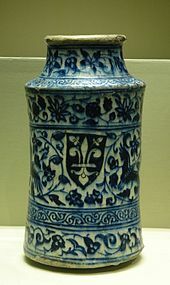 Azure, three fleurs-de-lis or) was granted by Louis XI in 1465. Armes of the Châteaubriant Family, concession of Saint Louis "Notre sang teint les bannières de France". In reality, there is no objective proof for the statement. Arms of the Thouars Family. The reverse of the arms of France. Arms of the Fitzpatrick (Mac Giolla Phádraig) family of Upper Ossory The French augmentation in the chief appears to date from the time of Barnaby Fitzpatrick as Edward VI's ambassador to France. Fleur-de-lis on 14th century Syrian albarello. In the Middle Ages, the symbols of lily and fleur-de-lis overlapped considerably in Christian religious art. Michel Pastoureau, a historian, says that until about 1300 they were found in depictions of Jesus, but gradually they took on Marian symbolism and were associated with the Song of Solomon's "lily among thorns" (lilium inter spinas), understood as a reference to Mary. Other scripture and religious literature in which the lily symbolizes purity and chastity also helped establish the flower as an iconographic attribute of the Virgin. It was also believed that the fleur-de-lis represented the Holy Trinity. The three petals of the heraldic design reflect a widespread association with the Holy Trinity, with the band on the bottom symbolizing Mary. The tradition says that without Mary you can not understand the Trinity since it was she who bore the Son. A tradition going back to 14th century France added onto the earlier belief that they also represented faith, wisdom and chivalry. Alternatively, the cord can be seen as representing the one Divine Substance (godhood) of the three Persons, which binds Them together. 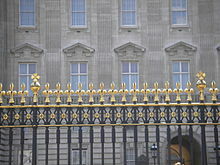 In building and architecture, the fleur-de-lis is often placed on top of iron fence posts, as a pointed defence against intruders. It may ornament any tip, point or post with a decorative flourish, for instance, on finials, the arms of a cross, or the point of a gable. 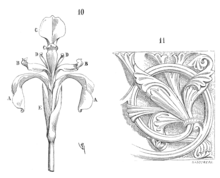 The fleur-de-lis can be incorporated in friezes or cornices, although the distinctions between fleur-de-lis, fleuron, and other stylized flowers are not always clear, or can be used as a motif in an all-over tiled pattern, perhaps on a floor. It may appear in a building for heraldic reasons, as in some English churches where the design paid a compliment to a local lord who used the flower on his coat of arms. Elsewhere the effect seems purely visual, like the crenellations on the 14th-century Mosque-Madrassa of Sultan Hassan. It can also be seen on the doors of 16th-century Padmanabhaswamy Temple. Some modern usage of the fleur-de-lis reflects "the continuing presence of heraldry in everyday life", often intentionally, but also when users are not aware that they are "prolonging the life of centuries-old insignia and emblems". A soldier of the Manchester Regiment with their fleur-de-lis badge on his helmet, in 1941. Fleurs-de-lis are featured on military badges like those of the United States the New Jersey Army National Guard unit 112th Field Artillery (Self Propelled) (part of the much larger 42nd Infantry Division Mechanized)has it in the upper left side of their Distinctive Unit Insignia. Army's 2nd Cavalry Regiment, 62nd Medical Brigade, 256th Infantry Brigade Combat Team and the Corps of Cadets at Louisiana State University. It is also featured by the Israeli Intelligence Corps, and the First World War Canadian Expeditionary Force. 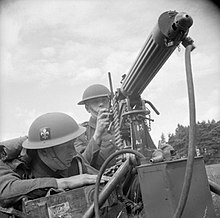 In the British Army, the fleur-de-lis was the cap badge of the Manchester Regiment from 1922 until 1958, and also its successor, the King's Regiment up to its amalgamation in 2006. It commemorates the capture of French regimental colours by their predecessors, the 63rd Regiment of Foot, during the Invasion of Martinique in 1759. It is also the formation sign of the 2nd (Independent) Armored Brigade of the Indian Army which was known as 7th Indian Cavalry Brigade in First World War, received the emblem for its actions in France. The fleur-de-lis is used by a number of sports teams, especially when it echoes a local flag. This is true with the teams from Quebec (Nordiques (ex-NHL), Montreal Expos (ex-MLB) and Montreal Impact (MLS)), the teams of New Orleans, Louisiana (Saints (NFL), Pelicans (NBA), and Zephyrs (PCL)), the Serie A team Fiorentina, the Bundesliga side SV Darmstadt 98 (also known as Die Lilien – The Lilies), the Rugby league team Wakefield Trinity Wildcats, the NPSL team Detroit City FC and the Louisiana Soccer Association. Marc-André Fleury, a Canadian ice hockey goaltender, has a fleur-de-lis logo on his mask. The UFC Welterweight Champion from 2006 to 2013, Georges St-Pierre, has a tattoo of the fleur-de-lis on his right calf. The IT University of Copenhagen's soccer team ITU F.C. has it in their logo. France uses the symbol in the official emblem on the 2019 FIFA Women's World Cup. The emblem appears in coats of arms and logos for universities (like the University of Louisiana at Lafayette and Saint Louis University and Washington University in Missouri) and schools such as in Hilton College (South Africa), St. Peter, Minnesota, Adamson University and St. Paul’s University in the Philippines. The Lady Knights of the University of Arkansas at Monticello have also adopted the fleur de lis as one of the symbols associated with their coat of arms. The flag of Lincolnshire, adopted in 2005, has a fleur-de-lis for the city of Lincoln. It is one of the symbols of the American sororities Kappa Kappa Gamma and Theta Phi Alpha, the American fraternities Alpha Epsilon Pi, Sigma Alpha Epsilon and Sigma Alpha Mu, as well as the international co-ed service fraternity Alpha Phi Omega. It is also used by the high school and college fraternity Scouts Royale Brotherhood of the Philippines. The fleur-de-lis is the main element in the logo of most Scouting organizations. 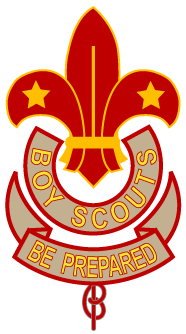 The symbol was first used by Sir Robert Baden-Powell as an arm-badge for soldiers who qualified as scouts (reconnaissance specialists) in the 5th Dragoon Guards, which he commanded at the end of the 19th century; it was later used in cavalry regiments throughout the British Army until 1921. In 1907, Baden-Powell made brass fleur-de-lis badges for the boys attending his first experimental "Boy Scout" camp at Brownsea Island. In his seminal book Scouting for Boys, Baden-Powell referred to the motif as "the arrowhead which shows the North on a map or a compass" and continued; "It is the Badge of the Scout because it points in the right direction and upward... The three points remind you of the three points of the Scout Promise", being duty to God and country, helping others and keeping the Scout Law. The World Scout Emblem of the World Organization of the Scout Movement, has elements which are used by most national Scout organizations. The stars stand for truth and knowledge, the encircling rope for unity, and its reef knot or square knot, service. The symbol may be used in less traditional ways. After Hurricane Katrina many New Orleanians of varying ages and backgrounds were tattooed with "one of its cultural emblems" as a "memorial" of the storm, according to a researcher at Tulane University. The US Navy Blue Angels have named a looping flight demonstration manoeuvre after the flower as well, and there are even two surgical procedures called "after the fleur." American automobile manufacturer Chevrolet takes its name from the racing driver Louis Chevrolet, who was born in Switzerland. But, because the Chevrolet name is French, the manufacturer has used the fleur-de-lis emblems on their cars, most notably the Corvette, but also as a small detail in the badges and emblems on the front of a variety of full-size Chevys from the 1950s, and 1960s. The fleur-de-lis has also been featured more prominently in the emblems of the Caprice sedan. A fleur-de-lis also appears in some of the logos of local Louisiana media. Such as in the logo of WGNO-TV, the local ABC-affiliated television station in New Orleans, and WVUE-TV, the local Fox-affiliated television station in New Orleans. The fleur-de-lis is one of the objects to drop during the New Year's Eve celebrations in New Orleans. New Orleans sludge metal band Crowbar use it as a logo. It's appeared on every album cover since Lifesblood for the Downtrodden and is sometimes incorporated into the artwork (on The Serpent Only Lies as a snake and on Sever the Wicked Hand as a sword's hilt). The symbol has featured in modern fiction on historical and mystical themes, as in the bestselling novel The Da Vinci Code and other books discussing the Priory of Sion. It recurs in French literature, where examples well known in English translation include Fleur-de-Lys de Gondelaurier, a character in The Hunchback of Notre Dame by Victor Hugo, and the mention in Dumas's The Three Musketeers of the old custom of branding a criminal with the sign (fleurdeliser). During the reign of Elizabeth I of England, known as the Elizabethan era, it was a standard name for an iris, a usage which lasted for centuries, but occasionally refers to lilies or other flowers. It also appeared in the novel A Confederacy of Dunces by John Kennedy Toole on a sign composed by the protagonist. ^ /ˈflɜːr də ˈliː(s)/; French: [flœʁ də lis]. The Oxford English Dictionary gives both pronunciations for English. In French, Larousse and Robert have the former: [lis]. The CNRTL has that pronunciation for the plant itself, but, following Barbeau-Rodhe 1930, [li] for the compound fleur-de-lis. ^ Michel Pastoureau (1997). Heraldry: Its Origins and Meaning. Thames and Hudson. p. 98. ISBN 0-500-30074-7. ^ Hall, James (1974). Dictionary of Subjects & Symbols in Art. Harper & Row. ISBN 0-06-433316-7. p.124. ^ "Fleur-de-Lys". Fleur-de-Lys Administrative Committee. 18 November 2012. Archived from the original on 6 October 2014. ^ "Republic of Bosnia and Herzegovina, 1992-1998". Flagspot.net. Retrieved 3 February 2012. ^ Alemany 2009, p. 4-5. ^ Mitteilungen des Instituts für Österreichische Geschichtsforschung (in German) (LXXI. Band, Sonderdruck ed.). Hermann Böhlaus Nachf., Ges.m.b.H. / Graz-Köln. 1963. ^ McVicar, Jekka (2006) . Jekka's Complete Herb Book (Revised ed.). Bookmark Ltd. ISBN 1845093704. ^ Pierre Augustin Boissier de Sauvages (1756). Languedocien Dictionnaire François. p. 154. Retrieved 27 July 2013. ^ a b "Dictionnaire raisonné de l'architecture française du XIe au XVIe siècle – Tome 5, Flore – Wikisource" (in French). Fr.wikisource.org. Retrieved 3 February 2012. ^ a b Velde, François. "The Fleur-de-lis". Retrieved 13 September 2013. ^ John Thomas, Elpis Israel (1851), 339–342. ^ Ellen J. Millington, Heraldry in History, Poetry, and Romance, London, 1858, pp. 332-343. ^ Ralph E. Giesey, Models of Rulership in French Royal Ceremonial in Rites of Power: Symbolism, Ritual, and Politics Since the Middle Ages, ed. Wilentz (Princeton 1985), p. 43. ^ Michel Pastoureau (1997), Heraldry: Its Origins and Meaning, 'New Horizons' series. London: Thames & Hudson. pp. 99–100. ^ Arthur Charles Fox-Davies, A Complete Guide to Heraldry, London, 1909, p. 274. ^ a b Michel Pastoureau (1997), Heraldry: Its Origins and Meaning, 'New Horizons' series. London: Thames & Hudson. p. 100. ^ Joseph Fr. Michaud; Jean Joseph François Poujoulat (1836). Nouvelle collection des mémoires pour servir a l'histoire de France: depuis le XIIIe siècle jusqu'à la fin du XVIIIe; précédés de notices pour caractériser chaque auteur des mémoires et son époque; suivis de l'analyse des documents historiques qui s'y rapportent. Éditeur du Commentaire analytique du Code civil. Retrieved 27 July 2013. ^ Pierre Goubert (12 April 2002). The Course of French History. Taylor & Francis. ISBN 978-0-203-41468-2. Retrieved 27 July 2013. ^ Cahoon, Ben. "Italian States to 1860 P - V". www.worldstatesmen.org. Retrieved 21 October 2018. ^ "The Fleur-de-Lys". Heraldica.org. Retrieved 3 February 2012. ^ Post, W. Ellwood (1986). Saints, Signs, and Symbols. Wilton, Connecticut: Morehouse-Barlow. p. 29. ^ Church Symbolism – F. R. Webber, Ralph Adams Cram – Google Boeken. Books.google.com. Retrieved 3 February 2012. ^ "Bharat Rakshak :: Land Forces Site – Armoured Formations". Archived from the original on 29 September 2014. Retrieved 30 September 2014. ^ Walker, Colin (March 2007). "The Evolution of The World Badge". Scouting Milestones. Archived from the original on 7 December 2013. Retrieved 11 December 2013. ^ Troop 25. "Origin of the World Scouting Symbol "Fleur-de-lis"". Web. USA: Troop 25, Scouting of America. Archived from the original on 17 July 2011. Retrieved 30 September 2010. ^ "New Orleans LA Living & Lifestyle". NOLA.com. 1 November 2011. Archived from the original on 25 June 2009. Retrieved 3 February 2012. ^ "The Faerie Queene: Book II". Archived from the original on 4 December 2014. Retrieved 4 December 2014. 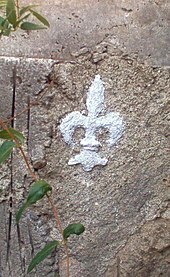 Wikimedia Commons has media related to Fleur-de-lis.